We are offering a wide range of Steel Wire Brushes that is used for rubbing and smoothening wires. 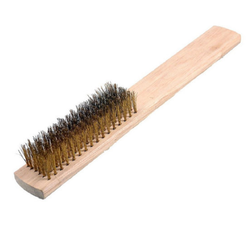 High-quality unmounted brushes are used for polishing with flexible shaft motors. Have either 3/32" or 1/8" centre holes. Bristles will not come out during use because the hubs are highly. compressed. These brushes are available in a single-stem/single-spiral construction for hand use or a in a double-stem/single or double-spiral for powered use. Single stem tube brushes for hand use have a long wire handle with a loop on the end and are 6" to 16" in overall length. Welders wire brush available in wooden and plastic handles with wire bristles in MS, GI, BC, SS. Available in 3, 4, 5 6 Rows. Enriched with vast industrial experience, we are involved in offering a wide range of Conveyor Chain Brush. These are engineered using best available technologies and as per world class standard. Our products are acclaimed for their longer functional life and precise design. These can be availed at market leading rates. brass & steel brush with shank made of brass & steel with mandrill easily, securely fit in polishing machines for cleaning & finishing with flex shafts. We are one of the Leading Manufacturer of Metal Hard Brush. We offer all type of matel wire brushes roller as per drg ang part samplel . also as per sample wire . We offer Steel Wire Brush for Welding & Metal cleaning applications. These wire brushes are common among engineering fabrication industries for its Economical Design and prices. Omni wire brushes are made of high quality materials , Encapsulated brushes help in removal of rubber around the steel cables. Brush items - pencil brushes, wire brushes, metal brush, varnish brush, natural hair brushes and various types of brushes.